Anne was introduced to Yoga in 2005 after working in the Fitness Industry for years. When experiencing not only the physical, but also the emotional and spiritual effects of Yoga, her whole perspective on how we can keep ourselves and each other healthy in every way was forever changed. Anne’s lighthearted teaching style has it’s roots in her initial Anusara-inspired yoga teacher training, always keeping the Universal Principles of Alignment and the heart quality in mind. 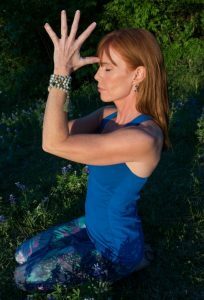 Anne combines elements from her continued and varied yoga teacher trainings with her intuitive sense for adding music and meditative themes, offering the students an opportunity to practice in a loving, empowering and safe environment. Anne teaches weekly adult yoga classes, monthly Full Moon Workshops, after school yoga classes and yoga for kids with special needs. She is a Kids Yoga Teacher Trainer as well. Her goal is to help people – regardless of age, life stage and ability – experience the multifaceted benefits Yoga can have in store for them. 2016-2019 © Yoga Heart Studio | Wordpress Management by WP Management Co.